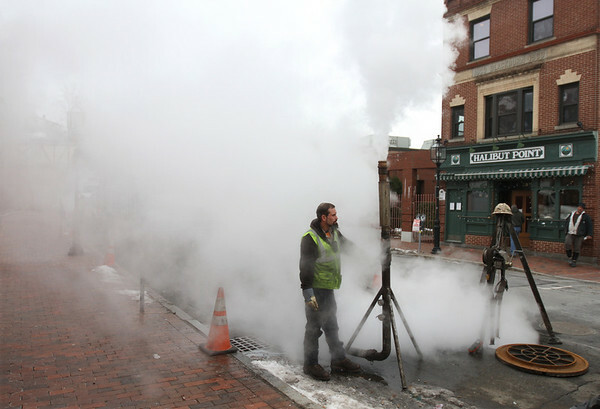 A worker with Layne Inliner, a company contracted by the City of Gloucester, adjusts the flow of steam through a 120-foot segment of underground sewer line Friday on the 200 block of Main Street in Gloucester. The company used the steam to apply heat to cure the epoxy resin in a synthetic liner it placed in the old clay sewer pipe. The procedure, which was also performed Thursday on a 300-foot section of sewer line a little farther down the street, makes it possible to seal an underground leak without digging.